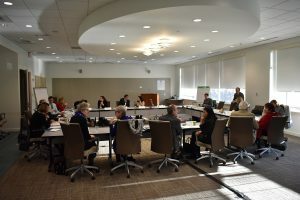 MHQP convened a distinguished group of 24 representatives (see list) from key stakeholder groups in Massachusetts healthcare, including patient advocates, health plan representatives, providers, researchers and healthcare innovators. The purpose of the meeting was to consider how we as a community might improve affordability by enhancing patient engagement and promoting a better understanding of consumers’ perspectives on the issue. 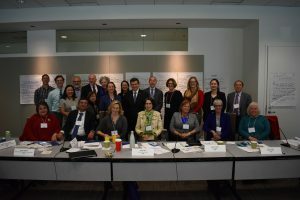 The meeting was supported by Robert Wood Johnson Foundation and the Network for Regional Healthcare Improvement (NHRI), which supported similar affordability meetings throughout the country convened by regional health improvement collaboratives. MHQP’s meeting was unique in that it was the only one focused on the role patients can play in improving affordability. Another important context for this discussion were Massachusetts’ efforts to address affordability at a policy level, having successfully implemented and led the nation on universal access. Trust – Healthcare is built on relationships and relationships are built on trust. A trusting relationship between patients and providers improves outcomes and healthy behaviors. The current healthcare system makes it challenging for stakeholders to build strong productive relationships. Health Literacy – The vast complexities built into our healthcare system have made it very difficult for consumers to be knowledgeable about their medical conditions, how to best navigate the healthcare system, their health benefits eligibility and coverage, and how to find the best value providers in their area. Capacity – System complexity and care fragmentation place an enormous burden on consumer capacity. Many patients are unable to balance competing priorities to make sound and sensible healthcare decisions. Others are limited by lack of energy, time and/or resources to effectively engage with providers or the healthcare system. Access – Too often, patients struggle to gain appropriate and reliable access to the healthcare system, providers, choice of treatments, generic drugs and information. Many factors can restrict effective entry or use of the system, all of which directly hinder patient engagement. Transparency – The information patients need to make effective healthcare decisions is not available in a reliable or easily understood manner. This information should include data about cost, quality, efficiency and consumer experience, so as to influence the behavior of patients, providers, payers, and others to achieve better outcomes. Standardize communications across plans and providers to reduce complexity. Create training/tools for patients to better understand their healthcare benefits. Promote uniform public service messaging and educational materials across multiple channels. Create training/tools for providers and care teams around communicating with patients about costs/care decisions. Offer healthcare beyond office visits to increase access to care without destabilizing primary care. Measure patient engagement to drive improvements. Expand availability of community venues with a focus on vulnerable populations. MHQP is extremely grateful to all Roundtable participants for their time and commitment to these important ideas. One specific action step coming out of this effort is that MHQP has been named a strategic partner in the Massachusetts Employer Healthcare Coalition (MEHC), an employer-led effort aimed at reducing health care costs by reducing unnecessary use of emergency departments. Beyond that, we are continuing to process this material with MHQP’s Board and Councils and will be identifying specific proposals for advancing the work forward. We invite you to stay tuned and welcome your feedback and suggestions on this important initiative.